In addition to the fountain pen, this edition will also be available as a ballpoint and a rollerball which is a nice touch. No word yet on what domestic pricing will be and I’m very curious to know based on the surprisingly low MSRP of the recent M605 White Transparent. Appelboom reports that the suggested retail price overseas is €525 (~$618.49) for the fountain pen with a retail price of €430 (~$506.58) for US customers. The ballpoint has an MSRP of €365 and the rollerball is €395. The pens will come with an attractive gift box and vendors are beginning to take pre-orders now. I love the look of the new M805. There is a lot of richness to those blue-green tones and I’m sure the pen is likely to look even more stunning in person. The M805 size doesn’t ring true for everyone but I’ve already made a space in my pen chest for this beauty. There won’t be too many more releases for 2017 (though I’m not sure this is the last of the year) and this is a great way to wind things down. What do you think about this new addition to the M8xx line-up? Gorgeous in product shots for sure. I can’t wait to see how the colors actually play under the lights in the real world. I’m expecting this one to be even more incredible looking in person. Is it more green or more blue. The color is a bit changed in every photo. I have seen very green pictures and I have seen bluer pictures. My gut is that this is a blue-green type of teal that leans more bluish. Unfortunately, the only way to know for sure is to see real world photos and not product shots. I look forward to seeing it. Perhaps to owning it. At the Hub I fell madly in love with the m800/805. I was able to try several of them. Of course the price will determine everything. I am almost ready to buy my first expensive pen. The Custom 823 is still tied with the Pelikan. Unfortunately I didn’t get to demo one! That is really one of the great things about the Hub event. There are so few brick and mortar stores left where we can actually try before we buy. The Hub really allows you to experience pens you otherwise wouldn’t be able to. I loved the Hub. We had absolutely the worst venue possible. Dark, loud and too small at the back of a raucous bar! But, the pen people are so terrific! This was my first hub and the people and all their wonderful pens is what made it great! I wish I had a group close to me. Glad you enjoyed. Finding a proper venue is no small feat so I can sympathize with some of the challenges that you had to endure. Great job reporting this, Joshua. Thanks. Glad to hear that you like it. I tried not to oversell it. Glad it lives up to the hype. Thanks! I think this will be on a lot of people’s “must have” list. I really love the brand but wouldn’t mind them throwing out a stinker every now and then so that I could unequivocally take a pass. Oh my. Already on my holiday list. I love the 800 series and this one is just gorgeous… and not stupidly priced. Thanks Josh! I think the overseas price is reasonable. I’m very interested about what domestic pricing may be. Chartpak is usually 1-2 weeks behind the international scene so it will probably be a few more days before we have domestic pricing figures. I know it. Definitely not what it was. Its a moving target though and will fluctuate. Josh, it’s gorgeous! I love the teal and blue colors. The 800 series is a little large for my hands, but you never know…this one is so pretty, I might just have to have one. Thanks for bringing us news of this beautiful pen! Gorgeous indeed and you’re welcome. The M800 fits nicely in my hand so it’s a no brainer for me. Would be nice to see more finishes like this filter down to some of the smaller models though. I do think that they reserve their best finishes for the M8xx series these days. Instant drooling and 2 yo “Wanna, wanna, wanna…!” response. You’re absolutely right. Some pens I have to talk myself into (it’s not a long conversation usually). This was cash in hand at first sight. Yes please! Please forgive a voice of dissent. I always feel that the end of the pen being in the blue would make the pen more attractive. The bit where your fingers is, doesn’t matter, it’s the end that makes the black too dominant. Look at the new all white and it really is gorgeous. I’m sorry but it doesn’t work. Nothing wrong with multiple opinions and I respect yours. I believe that you’re referring to the black section between the barrel and nib, but please correct me if I’m wrong. I personally like the black piston knob and section because it provides contrast against the pattern of the barrel. If it was all patterned, to me that would look too uniform and hideous. That’s one reason that I favor the M800 Grand Place over the M620. Aesthetic considerations aside, I’m sure that it’s cheaper to use the standard black parts to keep production cost down. Both my heart and my head are saying I must have this. Unfortunately, my wallet, after forking out for the 200 Smokey Quartz and the 605 White Transparent, is saying most definitely no !! Ha! Whatever you need to tell yourself. Those are two nice pens that you’ve picked up though. Congrats on the acquisitions. Fortunately for my wallet, teal is not my color. I’m still blown away by my Renaissance Brown, though. The Renaissance Brown remains a stunner. Who would have thought that a brown pen could be so interesting and pleasing to look at. I love Pelikans, I have one MX05, the rest are MX00 or NNs and I have no love for the MX05 Line. Why do I have to make the nibs better by using a nib meister? That didn’t have to happen with the old pens. Beautiful to look at, no more. Now, give me an Italic, fine Italic, M Italic, a Music nib…. etc… Then you are talking. I completely understand where you’re coming from and appreciate your comments. The lack of character of Pelikan’s (and most other manufacturer’s nibs) is probably my biggest gripe these days (aside from high US prices). There is no comparison with Pelikan’s nibs from the 50s and 60s. We also now lack a lot of variety of sizes which is a shame. I don’t see this situation improving anytime soon. I think the enthusiast crowd is a minority voice. The nice thing is that there are plenty of older offerings out there to satisfy your desire for expressive nibs. Thanks for sharing the coupon code. That makes one of these $410 for US customers. Can’t beat a price like that. I’m tempted to take advantage of that coupon for this truly striking new M805, but it is worth noting that Chartpak will no longer honor non US (or North American) purchases for, say, Pelikan’s free 30 day nib swap. I suspect the same applies to all warranty issues. I learned this the hard way earlier this year when I got a bird from the UK with a bum nib. That is absolutely correct. Any pen purchased overseas will not have its warranty honored by Chartpak. I believe this was put into place to discourage US customers from taking advantage of the much better prices when purchasing abroad. Indeed, that must be the reason. I would not be concerned at all about the warranty issue. I buy my pens from LCDC and have saved probably close to a few thousand dollars. They have outstanding customer service and I have not had any issues with pens from them at all. In the off chance something is wrong with the nib, it can just be sent to a nibmeister to fix it and even give a custom grind at that point. To me, the money you will spend for this service is much less than if you purchase from a US authorized dealer. And even though the euro to dollar exchange rate isn’t as favorable for US customers currently, buying from abroad still is a better value, at least to me. I share your views Joe. The savings, to me, outweigh the loss of warranty. I’m sure others may feel differently and I think a lot depends on your comfort level. You can still get great after sales support for overseas, it’s just not as convenient. There is always the argument that you shouldn’t need a nib meister for a new pen but I consider it a calculated possibility with every pen purchase. December 2016 – April 2017 was the sweet spot for the exchange rate. I agree though, savings are still greater when shopping overseas. Does LCDC charge your card immediately or wait until an order is ready to ship? Thanks. I have already enquired about buying one of these M805`s from a favourite shop I use. As I live in the UK I do not think I will have a problem obtaining one. You should be good tracking one down. I expect that these will be widely available. A little off topic for this post but, in brief, an M400 is a modern reintroduction of the 400. The M400 was first released in 1982 and had a redesign in 1997 so there are two trim variants. The older variant looks very similar to the original 400. They are all roughly the same size. The nibs on the M400 aren’t as good as the older ones and the new models use plastic feeds rather than ebonite feeds. The older 400 was introduced in the 1950s and had 3 variants that ran through 1965. All are very reliable and excellent pens. The big differences is the character and expressiveness of the nibs. Hope that helps you. If you have further questions, feel free to use the contact from to get in touch with me. Hi Joshua,Thank you for letting people know about this stunning M805.I have now placed my order for one,November cannot come quick enough for me.So looking forward to inking it up and using it. You were not kidding when you said this one would be beautiful!! Thanks for letting us know in advance and for the report above. People on FPN figured out the barometer that is under it in the photo above and it seems that its going to be blue(ish)! So, even better. Congrats on the pre-order. I too have one coming. I think blue is how this will lean which seems to be the better direction from the consensus I’ve seen. Joshua, your posts are a great help and most appreciated. 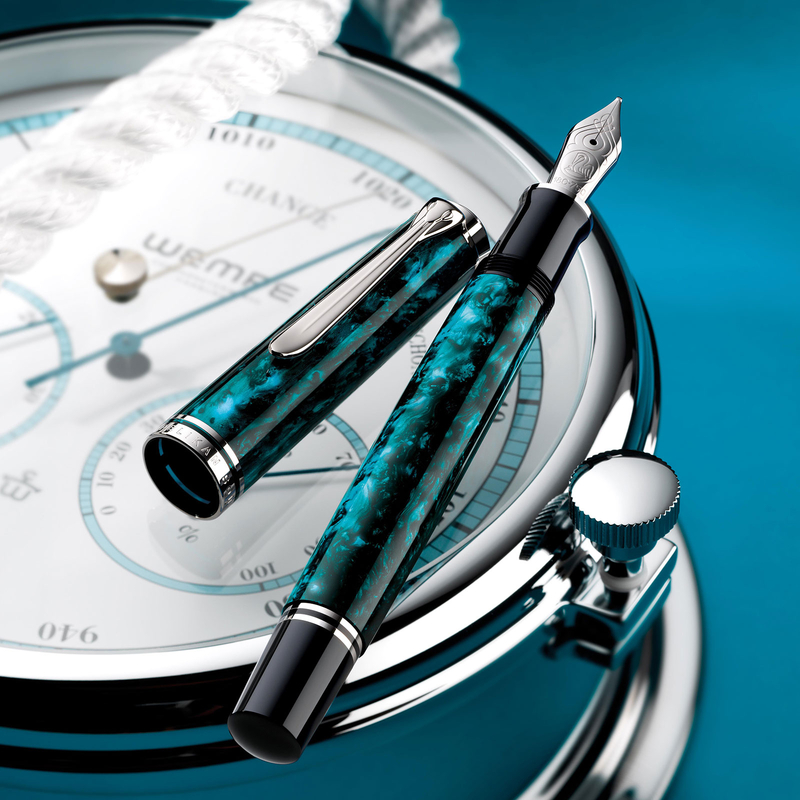 While I have been trying to wind down on my pen purchases, the Ocean Swirl is one I think I must have. The San Antonio Hub was a geat success, & a number of us are continuing to meet afterwards. Pen people are great, & we really enjoy interacting with each other. Your site is a great stimulus for all of us. Many thanks & best wishes! Thank you very much for your kind words. I’m glad to hear that San Antonio went well and I love the fact that connections made there are lingering long after the Hub has ended. I hope to keep being a positive stimulus for you and your group. Thanks so much for taking the time to visit my site and to leave a comment. just pre-ordered my ocean swirl! Thanks for the heads-up back in July! I used to pass in Pelikans in favor of other pens, but having the Pelikan customized by John Mottishaw has made this the ideal pen for me. It has even led me to selling off all of my Nakayas. The problem now is keeping the flock to two! Oh Mike, I think you have made a fatal error! – There is a greater chance of avoiding an increase in your Pelikan population if you strictly keep to one. Once you have a pair, an explosion in numbers is inevitable. Like Peter said, you’re doomed from the start if you’re going to keep two. That’s a breeding pair and it won’t be long before you find a third addition to the flock. It gets rather exponential. Recieved my Ocean Swirl yesterday and have to say the photos only loosely resemble the real thing. Mine is considerably darker in appearance, but has a depth that I cannot even begin to see in the pictures above or at the Pelikan homepage. And although the pen clearly has the same format as the M805 Vibrant Blue and the M800 Rennaisance Brown it seems leaner and way more elegant. And I finally have the pen for my Edelstein Aquamarine ink, it’s a perfect fit! Sounds like your happy with it then. I find more and more lately that the promotional shots really aren’t doing Pelikan’s products much justice. Some of these finished are hard to capture in their defense. Can’t wait to get mine! Thanks for sharing your impressions. The pen is really gorgeous and, as always, with Pelikans the nib writes fautlessly. The design of the pen reminds me of the Vibrant Blue and Renaissance Brown, both of which i have (inevitably). But these two are more marbled in design, making the Ocean Swirl subtly different. The dark green/blue of the Ocean Swirl is at its best under a subdued light, not out in direct sunlight, at least in my experience. I highly recommend this pen but I would advise those who buy them to carefully select an example with the most attractive body- something which is, of course, not possible if you buy online etc. Helo Philip. Funny how we really don’t “need” another Pelikan yet they continue to accumulate. King Lear indeed had it correct were he speaking about fountain pens collectors. As you point out, the Ocean Swirl seems to draw from its predecessors while adding a new dimension unique to itself. It’s amazing how the pen changes its look depending on the light. I think your criticisms are well founded and I don’t disagree with you. In my mind, this is one release where the pre-release promotional photos don’t do the pen justice and I think that owes to the difficulty inherent in capturing a pattern such as this one. I see that some of you already received your Ocean Swirl. LCDC notified me the pen is on its way. I was hoping it would arrive in time for Christmas. My reindeer dispatch is slow!!! Looks like it will be next week. I am so eager to see the pen. Anyway, Merry Christmas and Happy Holidays everyone. Look forward to what Pelikan releases in 2018. The ocean swirl will be my 3rd M8xx and it is sitting in the box waiting to be opened. My wife asked what I wanted so I told her! Have some ku jaku ready to ink it up. NICE! Something you want and it will be forever sentimental. Mark, you are a lucky man. Congrats on the great gift and an awesome/understanding wife. Ku jaku sounds like a nice combo.